I’m blogging this pic because the quotes are mostly taken from my favourite Dr Seuss book (ever since we read it for someone’s birthday) and there are five of them, which is my favourite number. Ha! And reading the list of simple truths made me grin a silly happy grin, so I want to share my joy with you. Yes, you. It’s amazing how Dr Seuss can write stories that appear to be made up of gibberish and yet they are so enlightening. Agree? 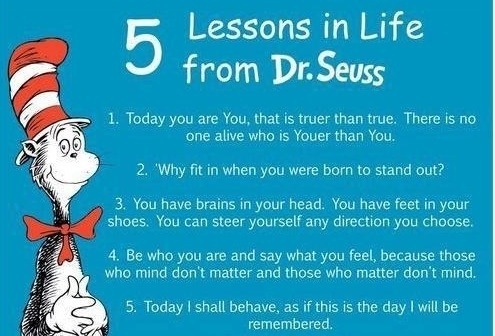 I am totally gonna live my life like how Dr Seuss thinks everyone should! Join me! P/S: This is also one of the fastest blog posts I have ever written.